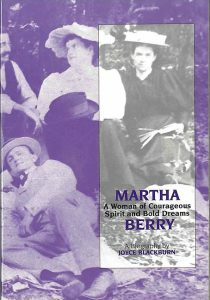 Martha Berry – Peachtree Publishing Company Inc.
Martha Berry started a revolution that has changed the lives of more young men and women than she ever dreamed possible—and her dreams were big ones. Starting with a tiny log cabin, Martha Berry devoted her life to building a school where underprivileged children could be taught a vocation along with academic studies. From her first contacts with the poor mountain children of Georgia, she faced disapproval from her more wealthy relatives and friends, and she encountered many disappointments. But her determination, coupled with her charm and genius, inspired both the poor and the wealthy to aid in her crusade for a better education for all children. Today Berry College stands as a fitting monument to the vision of this inspired woman, who was honored for her work by three presidents of the United States. Joyce Blackburn is well known for her prize-winning fiction and historical biographies for children. She has written fourteen books, including Suki and the Invisible Peacock, Suki and the Old Umbrella, Suki and the Magic Sand Dollar, and Suki and the Wonder Star, in addition to biographies of Martha Berry, Theodore Roosevelt, John Adams, James Edward Oglethorpe, and George Wythe. Ms. Blackburn lives on St. Simons Island off the coast of Georgia.